Hansje, Leneke and Valentina opening the interactive training session. 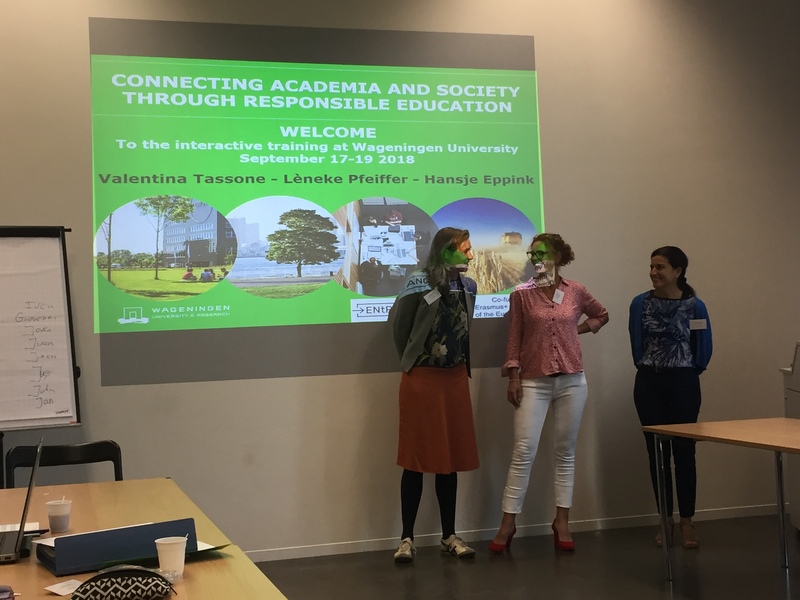 From the 17th until the 19th of September 2018, 25 higher education lecturers from the five ENtRANCE institutions have participated in a “CONNECTING ACADEMIA AND SOCIETY THROUGH RESPONSIBLE EDUCATION” training at Wageningen, The Nederlands. The interactive training was designed by ENtRANCE partner Wageningen University, based on a conceptual framework on responsible education they have written in the frame of the EnRRICH project. Good practices from that H2020 project were shared, but the training also offered insights into educational practices at Wageningen University that are connection academia and society, like the Academic Consultancy Training Course or the Settings for Health Promotion course. The 25 Belgian, Dutch, Finnish, Lithuanian and Portuguese participants engaged in discussions and reflected through learning journals on their action plans for implementing responsible education practices in their own institutions – which is the next ENtRANCE step.